In 1878, the Anglican priest and theologian, Frederic Farrar published a monograph defending hopeful universalism titled Eternal Hope. In the following year, Presbyterian theologian Robert Dabney published a review article critiquing two works including Farrar’s book. 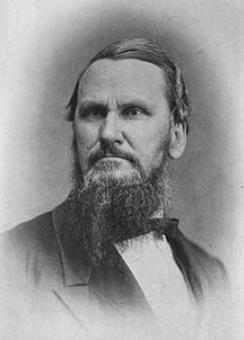 Dabney was a defender of the view that hell consists of eternal conscious torment: hence, the title of his review essay, “Eternal Punishment.” Full of Calvinist spit and vinegar, Dabney is always interesting to read, and this review essay is no exception. But while there is much to engage, in this article, I will focus on one argument that Farrar makes in critique of eternal conscious torment along with Dabney’s rebuttal. He [Farrar] represents the orthodox as teaching the odious idea that the saints will find an important element of their bliss in gloating over the despair and torments of those once their fellow-sinners. Among his proofs are citations from Thomas Aquinas, who says that the happiness of the saints will be enhanced by the law of contrast ; and from Jonathan Edwards, teaching that the knowledge of the nature of the torments from which divine grace has delivered them will enhance the gratitude of the redeemed. Ought not an honest mind to have seen the difference of these statements from his charge? Canon Farrar, let us suppose, has been saved from a shipwreck, in which a part of his comrades have perished. But can he not apprehend how adoring gratitude and joy from his own rescue would be increased by comparing himself, reclining safe and warm before the genial fire, with the battered corpses tossing amidst the sea-weed, while yet his whole soul might be melted with pity for them? It’s Dabney’s response – so apparently reasonable on its face – that I now want to subject to critique. But what Dabney doesn’t concede is that there is any malice in this pleasure. There is some surface crediblity to Davney’s response. I can definitely imagine deriving some added relief when contemplating my good fortune (or blessing!) in contrast to those less fortunate (or less blessed) blokes who lost their lives. And presumably, this added relief is not immoral or otherwise improper. Rather, given the circumstances, it is wholly natural. Imagine that a parent is saved from a shipwreck in which his daughter perishes. Can he not apprehend how adoring gratitude and joy from his rescue would be increased by comparing himself, reclining safe and warm before the genial fire, with the battered corpse of his daughter tossing amidst the sea-weed? I trust that you can appreciate how grotesque that sounds. Furthermore, I trust we can now appreciate that the only reason the original story didn’t sound grotesque is due to the fact that one doesn’t typically have a deep love for and connection with one’s comrades. Thus, Dabney’s defense depends on the emotional distance one has toward the drowned individuals in the example. Needless to say, when the comrades are close, as they are (for example) in a military unit, then the loss of comrades while one survives and returns to peacetime frequently leads not to an increased adoration, gratitude, and joy at one’s survival but rather a deepened pain, suffering, and survivor guilt, a pain that can lead to depression, despondency, and even suicide. To reiterate, Dabney’s entire illustration depends on one’s emotional distance from the damned. But it’s worse than that. According to an orthodox understanding of the doctrine of the new heavens and new earth, there is no more suffering or sadness for those who are resurrected to eternal life (Revelation 21:4). That state of emotional satisfaction and unmitigated pleasure is baldly inconsistent with even the minimal compassion that Dabney describes as a “whole soul” being “melted with pity” for the lost. There is no room in the resurrected state of glory for souls, as Dabney puts it, melted with pity for the lost. There is only joy. Thus, to the extent that the state of the redeemed and the state of the lost are understood to be concurrent, as they must be in eternal conscious torment construals of hell, it is difficult indeed to avoid the unseemly, if not abhorrent, view that the redeemed derive great pleasure as they contrast their blessed estate with the horrific torturous suffering of the damned. To think of oneself as saved and one’s child as damned only draws the abhorrent nature of this doctrine into even sharper contrast.